[AD] Celebrating National Doll Day with the Baby Born Interactive Doll – Boy! Today, August 5th, is National Doll Day. As a child my Doll, Tony Dolly, was my absolute best friend. Tony Dolly came everywhere with me. As a surprise my family even brought him to my 21st birthday and there are some fab photos of us dancing together – it’s amazing how you can still love a doll all those years later. We have also reviewed the Baby Born Interactive Doll – Girl. Lily is the same. She is never without a doll – she even sneaks a small one into her school bag! Lily’s best friend and favourite Doll at the moment is the Baby Born Interactive Doll – Boy; known affectionately in our house as Ben. Ben comes everywhere with us. Lily was so disappointed that we couldn’t fit Ben into our suitcase for our visit to Poland this weekend! The Baby Born Interactive Doll – Boy came with some beautiful accessories including a dummy & dummy clip, a bracelet for the doll and a matching one for the child, a bowl, spoon and 5 sachets of doll food a potty and a nappy. Lily loves the interactive features of the Baby Born Interactive Doll – Boy. Lily is currently potty training Ben so she takes great delight whenever he does a wee on the potty! He has had the odd accident (as you expect with someone in potty training!). Lily makes Ben cry, then reads him endless stories to soothe his tears. Lily takes Ben in the bath, takes Ben to the park and last week even brought Ben along to our local fire station open day. Ben is very much a best friend and has firmly been in pole position since we found out that we were expecting a boy. Lily is so excited about getting a baby brother at Christmas Time and in the mean time she is getting all her practise in with Ben. 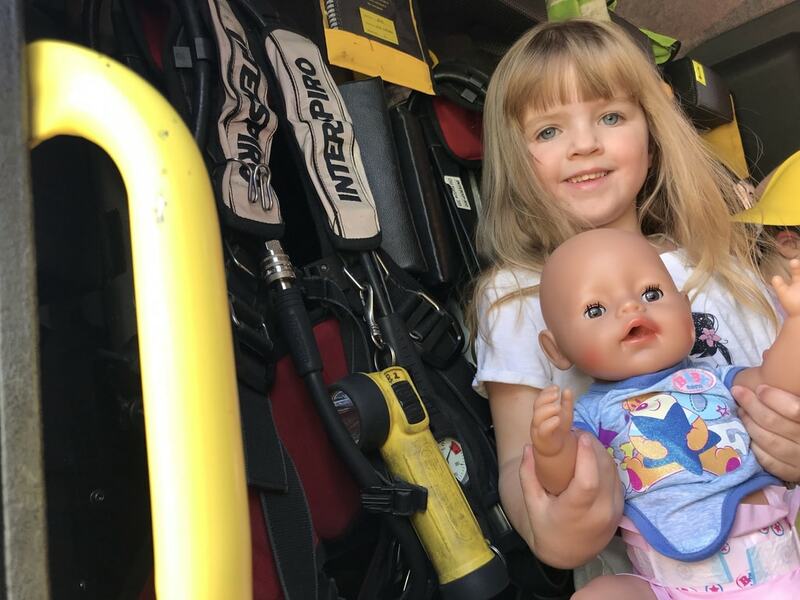 Lily has such a wonderful relationship with Ben, her Interactive Baby Born Doll – Boy and I hope that in years to come we can surprise Lily on a big day by bringing Ben to a party when she has long stopped playing with him, just like my family did for me. Disclosure: We were gifted the Interactive Baby Born Doll – Boy in exchange for an honest review.